I want to know all I can about aging well. After all, if I’m going to get older, I may as well do it in the best possible way. To that end, I’ve been studying how to age successfully. For my dissertation research, I interviewed women in their 60s who were part of New Thought spirituality. New Thought includes such groups as the Unity church and Spiritual Living Centers (Science of Mind), and a foundational belief is that as you change your thinking you change your life. The New Thought community maintains that you can affect the conditions of your body and your circumstances. I wondered how these beliefs have impacted the participants of my study as they age. After processing numerous hours of interview data, one of the themes that emerged was that the women felt empowered to influence what they experienced through their thoughts, words, and actions, and they did so deliberately. Rather than complain about challenges or allow fear to overtake them, they spoke with confidence about their wholeness and vitality. From what I observed, they had a high level of energy and a positive outlook no matter what particular issues they were facing. It’s like the concept of self-fulfilling prophecy. When you repeatedly say that you are sick, you invite that experience into your life. Wayne Dyer, Deepok Chopra, Norman Vincent Peale and others have written much on this idea and on the power of positive, affirmative thinking. The women in my study claimed health and well-being on a regular basis and they seemed to be experiencing the very thing on which their words and thoughts were focused. Could changing your thoughts make a difference in your life? Test the idea for yourself. Envision your body as growing stronger. Imagine new possibilities. 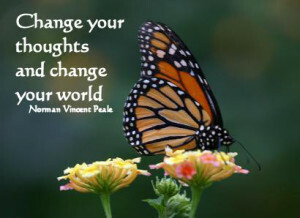 Then commit to taking the action needed to support your new thoughts. You just might change how you age.